India Pale Ale (or IPA) is a popular staple of homebrewers, microbrewers and hopheads who enjoy brewing some of the hoppiest beers on the planet. This week we look at India Pale Ale beer recipes, how to brew an IPA recipe and its history. According to Wikipedia, India Pale Ale traces its origins to the 17th century in England with the earliest pale ales. In fact, new malting techniques developed at the start of the 17th century using coke-fired as opposed to wood-fired kilns enabled production of the first pale malts, and subsequently paler beers. One of the popular pale styles was a beer called October beer, which was highly hopped and designed to be stored for an extended period. Note that this October beer bears no relation to German Oktoberfest beer. George Hodgson, owner of Bow Brewery brewed a version of October beer that was popular among the traders of the East India Trading Company in the late 1700’s. East India traders subsequently started trading many of Hodgson’s beers including his October beer. The highly hopped, high gravity, highly attenuated pale ale actually benefitted from the long trip to India and became popular with consumers there. Other brewers, including several large Burton breweries like Bass, Alsop and Salt lost their European export market in Russia due to new high tarrifs on beer. They quickly emulated the October beer of Bow Brewery and also started exporting to India. The style, which now was now commonly called “India Pale Ale” became popular in England as well around 1840. IPA is a hoppy, fairly strong pale ale traditionally brewed with English malt, hops and yeast. The American version has a slightly more pronounced malt flavor and uses American ingredients. The BJCP style guide for 2008 places original gravity at between 1.050 and 1.075, and highly attenuating yeasts are used to drive a final gravity between 1.010 and 1.018 for 5-7.5% alcohol by volume. Multiple hop additions dominate the flavor profile in IPAs. English IPA’s typically have 40-60 IBUs, though the slightly stronger imperial IPA versions can have hop rates as high as 120 IBUs. Color is similar to many pale ales – golden to deep copper color – varying between 8-14 SRM for the finished beer. 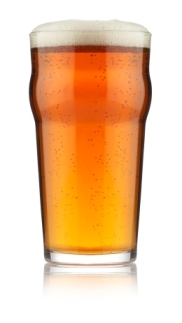 Moderate carbonation is often used, though some English IPAs are lightly carbonated. Hops dominate the flavor of an IPA, so careful selection of the hop additions is critical to success. Traditional English IPAs use popular English hops such as Fuggles, Goldings, Northdown, Target, though sometimes noble hops are also used in finishing. Higher alpha English hops are also popular for bittering. American IPAs use the rough American equivalents such as Cascade, Centennial, Williamette, though again higher alpha hops are often used in bittering. Multiple hop additions are almost always used for IPAs including bittering hops at the beginning of the boil, often several additions of finishing hops in the last 5-15 minutes of the boil, and dry hops to provide a hoppy aroma. In general, higher alpha hops are used for the base boil addition while aromatic lower alpha hops are used in finishing and dry hopping, though some traditional IPAs use lower alpha English hops throughout. Traditional English 2-row pale malt makes up the bulk of the grain bill (or two row American malt for the American IPA), usually around 85-90% of the total. Crystal and caramel malts are traditionally used to add color and body to achieve the desired overall color both in extract and all-grain recipes. Chocolate and black malts are not often used in commercial examples though they occasionally make their way into home-brewed recipes. Personally I prefer moderately colored caramel/crystal malt. Occasionally you will see wheat, flaked barley or carapils malt added to enhance body, though these are rarely used and only in small quantities. As many IPAs were first brewed in the English city of Burton, they share much with their English Pale Ale cousins, including the unusual Burton water profile which accentuates the hoppy profile. The Burton water profile has extremely high concentrations of calcium carbonate and bicarbonate. Depending on your local water source, a small addition of Gypsum (CaSO4) can sometimes help to simulate the hop-enhancing high carbonate Burton waters. IPAs are most often made with traditional English ale yeasts, though care must be taken to choose a highly attenuating yeast and avoid some of the lower attenuating, fruity British ale yeasts. Many brewers bypass the problem entirely by choosing a highly attenuating American or California ale yeast for a cleaner finish. All grain IPAs should be mashed at a lower temperature than pale ales to achieve the high attenuation desired. A mash temperature around 150F for 90 minutes will aid in breaking down more complex sugars for a clean finish that accentuates the hops. IPAs are fermented and stored at the traditional ale temperatures, usually around the mid 60’s F. Long storage periods are sometimes required to achieve the proper hop-malt balance. I hope you enjoyed this week’s article on the great India Pale Ale beer style. Please don’t hesitate to leave a comment or subscribe for regular delivery if you enjoyed this article. Have a great brewing week. Any suggestions where to find a recipe for German beer popular in the early 1700’s? We are celebrating Bach’s 325th birthday coming up in March, and wanted to follow it up with some home-brewed beer. No – though beers brewed in the early 1700’s were pre-industrial revolution and typically were ales (lagers came in in the 1800’s), often made with brown malt as true pale malt was not yet available. Often the malts were dried over wood fires, leaving a smoky taste. Often other spices were used instead of hops. I’m not sure you would enjoy a truly authentic beer of the age, but probably something like a continental brown colored ale would be reasonably close. I remember a Boston based IPA that was barreled in oak. It was marvelous. Do you know its name and who might make an equally woody ale today?? I have several hop vines that I’d love to use for beer production. However, I have no idea as to what variety they are. Is there any way to tell? I am very interested making my own IPA’s would you send me some free information and maybe include some of the supplies I will need to purchase to get statred. I see great recipes in your blogs and articles. How do I import them into my Beersmith program? A large number of these recipes are now available as “add-ons” using the add-on button in BeerSmith 2. Richard, your post on this was about a year ago , but I didn’t see any reply to you so .. Dogfishhead’s Burton Baton is a barrel aged ipa hybrid that has an incredible flavor ! It’s 10% abv so more of an end of the evening sipper. Another really nice one ( but, not sure about how much distribution it has) is Cigar City ( Tampa, Fl)” Jaialia ” is a white oak aged IPA and is very unique and delicious almost a fresh blackberry flavor comes out it it. The best IPA I have ever tried was Gales IPA. The brewery was bought out by Fullers a few years ago and closed. If I can find a clone then I will share it it with you. Forgot to add Gales and Fullers are both English breweries. just brewed my first ipa cant wait to try it. As a beginner I enjoy articles like this.I am surely going to make a nuisance of myself in future.!!! I am just starting with the whole home brewery craft. So far I’ve made about 15 gallons of beer. For what i am making, an amber ale, the fermentation time is 18-21 days. is this the same for the english I.P.A? or should i let it ferment longer? ﻿http://www.EasyBrew.in has a wide affordable range of German beer brewing equipment and products for home as well as commercial use. I have seen them work and they are really professional. They use equipment from a very popular German manufacturer. “As many IPAs were first brewed in the English city of Burton” Burton On Trent is a town in the Midlands and not a city and is known locally only in shorthand as Burton.